Best way to do this! I’ve been traveling all my life! I’ve never had an easier time planing a multi city, multi country trip for people originating at different locations!!! This app searches like I would! This app is great. When I travel I search a lot of options before I go. This really does look at all the airlines, includes weird stopover combinations, etc. I like it's ability to gather up the bargains and give me usable info. Love it! I love the search capabilities of Momondo especially the ability to use filters. It’s terrific! It has error 18, not working in some cases. I sent you by email my issue, but so far not resolved. Works as advertised. I enjoy using the app. I don’t usually rate apps but this one deserved it. Momondo, remember what made you great in this review. I have purchased all of my international flights (several) through Momondo over the past 2 years. They have the best price options and I really like the website format too! Best possible app and booking agency out there. I have booked a lot of time through momondo and I can say that it has always given me the best deals ever. Buying basic economy tickets directly from United Airlines would’ve been cheaper and sooooo much less hassle than using momondo. The “best” search result was for justairtickets.com and they are a scam with no actual discounts. You’ll be paying random strangers to make you jump through hoops for your tickets that aren’t even guaranteed to stay that price. Skip momondo and buy directly from the airlines or at least use orbitz. 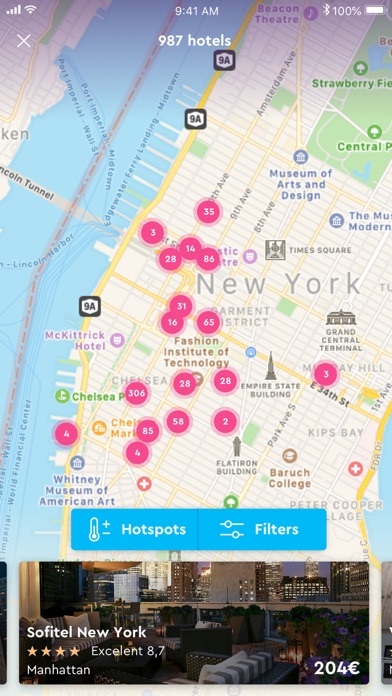 It’s almost impossible to figure out how to have the app track multiple flights. So confusing. 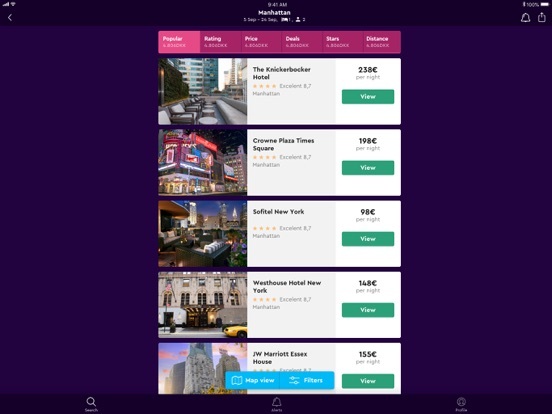 I’ve used many travel apps and I’ve always found the best prices on Momondo. 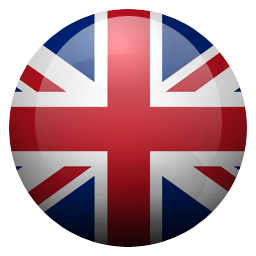 I have use this app for travel to europe and in the united states and is the best ! It search in all the other sites !! This app is definitely my favorite for finding flights. I prefer this app over Google Flights. I find it the easiest to use. The filter option works great! Never Use This App Ever!!! I just purchased a round trip from Denmark to Paris France and combined it cost $97. When I went into my credit cards receipts, I got an extra charge for $113 as a commissioning fee for using this. That is the worst thing ever and I’ll never use this app again and no one should ever use this also. P.S. The app changed into Danish like 1/4 of the way through purchasing the ticket and never gave an option to change back. Many sites have less than desirable reliability ratings. Momondo is pretty awesome! Great deals! Easy to use. Easy to use and best airfares!!! Consistently the lowest fares. I love ve this service!!! I really like being able to search anywhere. 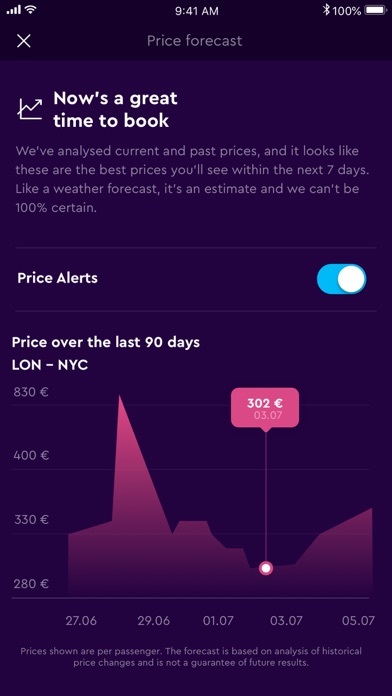 The price alerts are also nice. My complaint is that the app changes my criteria mid search. For example, if i select 4 passengers in the search it drops to 1 in the result. Absolutely love the seemingly endless ways to filter/sort/build your own ticket. 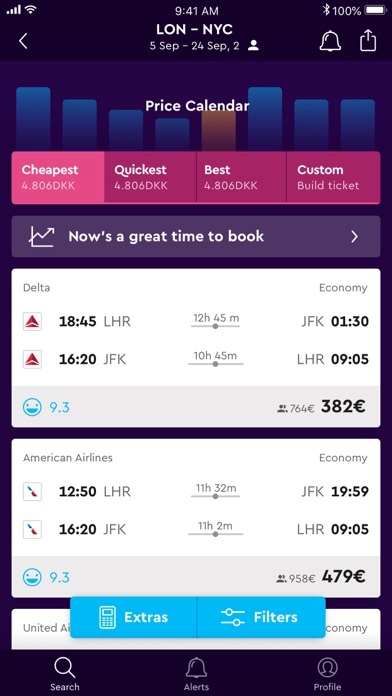 My go-to app for finding the perfect plane ticket at a great price. Thank you for all the work put into this app. Excellent app... I can’t stop using it! I always trust this app! Been using it for years! Never fails to cut corners and find the best deals! Learning to use the system as a new flyer. Best way to book flights! For flights these are the best prices I’ve ever seen! Well, in rating this app I gotta be honest. 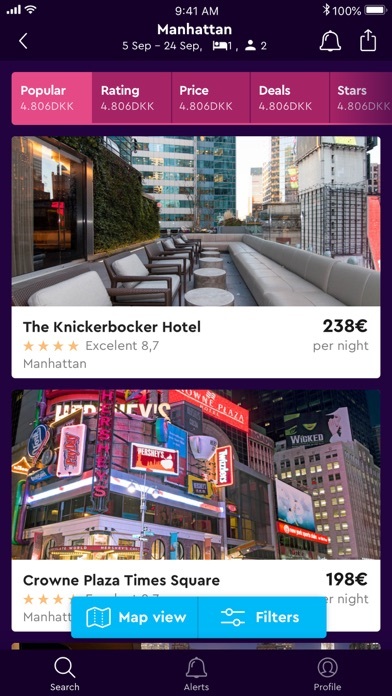 I compared Momondo with many apps and websites and found out that it’s the cheapest flights app. All the other apps and sites are more expensive than Momondo even the same flights differ in the price significantly!!! 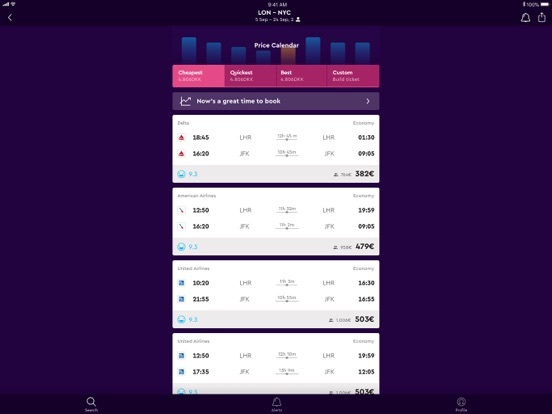 But Momondo is a great app for booking flights that I really recommend for everyone else. Thanks. Muy buen app y facil de utilizar muy comodo sin complicaciones!! The APP will not OPEN! Ever since I upgraded the app last week, I have not been able to open the app ! Please address the bug ! Почему я не могу убрать этот проклятый украинский язык из приложения? Как мне вводить аэропорт Милана , если у меня нет Украинской раскладки? We booked a flight to Florida for 348. It said processing and I went to bed. I woke up the next morning to a email stating I must call cheap air fare. I call and they tell me that price is no longer available and the new price is 1,000. I look up on momondo and it still showing the 348.. I tell this somewhat not nice person on the other end and he tells me if I try to book that then it’s not going to let me and I will have to pay the 1,000... WHAT KIND OF SCAM IS THIS? Btw.... here we are a day later and guess what??? On your app you are still advertising that 348... do not use this app... it’s a total scam! I have always used momondo for my flights. 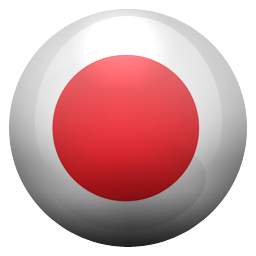 The easy to use app. makes it easy for one to buy a ticket! Loving this app. A hidden gem. Seeing some amazing prices for my upcoming trip. Excited to book soon and enjoy my trip with the money saved. It’s been a while since I’ve used Momodo, and been doing the updates as they come along. I sure miss the old format. Wasn’t able to get nearby airports in the mix. (Specifically DAL & DFW). I always find what I want! 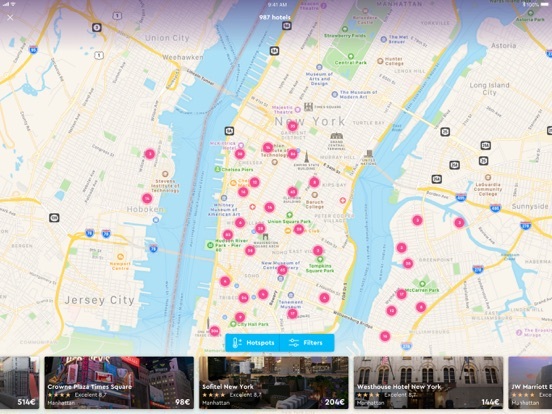 Momondo is the best travel search engine on the web. In the year alone I have tried to book 4 different flights and every time I tried to buy the ticket, the price for the ticket goes up significantly at the checkout! First I thought maybe I was just late in purchasing it but then it happened to me the 2nd, 3rd and 4th time so it can’t be a coincidence. What a waste of my time! Ticket prices are never what the initial search shows you. What kind of crap is that??? This app is such a disappointment and waste of everyone’s time. Momondo has made it happen for me on every trip I’ve gone one with no hassle ! They make it easy and affordable ! I love it ! So many possibilities! Great prices!! Fantastic travel engine!!! The absolute best way to look for your ideal ticket!! Absolutely love this app! Have found by far the best prices and every time I use the app it is a smooth and seamless experience! Love it! Cheap Flight Resource! I always consult this app when playing my trips to Europe. It is a great resource for finding cheap flights and hotel deals. I learned about Wow airline and Norwegian Air through this app. Using Momondo has saved me tons on flights! Update: after the most recent app update, the prices seem to be more expensive and my app will glitch and shut down sometimes. I still think it’s the best for cheap flights tho! Love this travel app. Simple and great price searches. Never wrote a review before, I’m 23 this app is the best for finding flights around the world on a budget. Great but the filters don’t seem to work. I just got flights for half the regular price via this app! I highly recommend it! 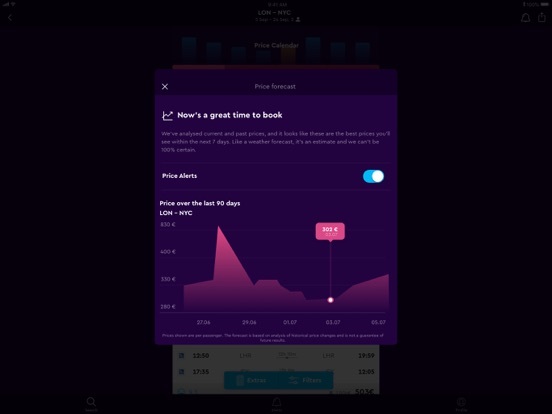 The app is a nice starting point for searching flight prices and getting ideas of where else to fly to based on the map search. HOWEVER, actual prices wildly differ from what is posted on the search map. So you actually have to use a pen and paper to list down actual prices and times yourself after tapping and search on each city. 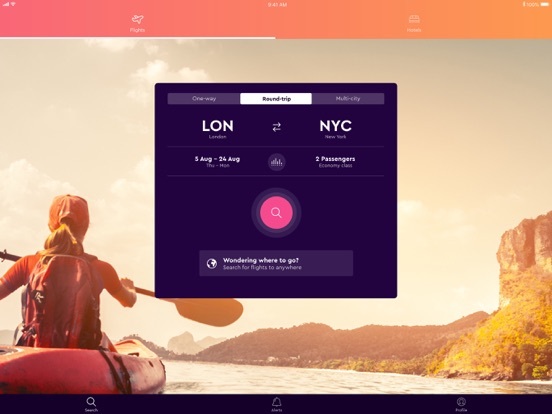 Momondo finds the best flight prices & fast. 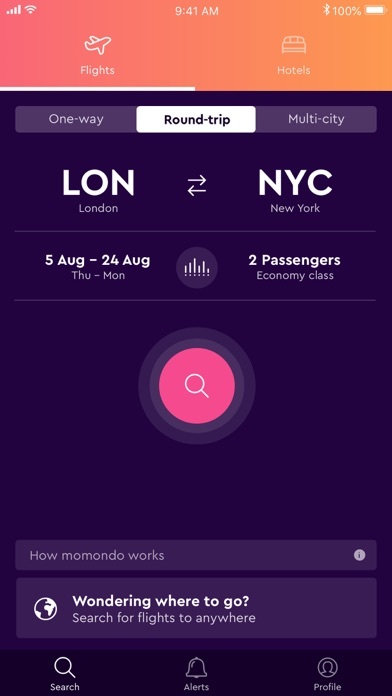 Momondo is hands-down the best and fastest flight search app available in the App Store. Hats off to the developers of this fantastic app and service. I consistently find better flight prices than I do on Google Flights, so I highly recommend you try this out, whether you are a frequent or casual flyer. Why are there no options for “Flexible Dates”? When I choose a different date near the departure or return, it turns out to be double the price! ¿Qué pasa con la seguridad al pagar? Reserve un boleto de Bogotá a Portland, pero jamás recibí notificación de que mi pago se había recibido. El código de confirmación que me dieron no existía con la aerolínea , y el número de teléfono que me daba para comunicarme con algún representante ni siquiera existe. Después llame directamente a la aerolínea y ya ellos me confirmaron de que no había ninguna reservación a mi nombre. I’m new to Momondo and so far am loving it. It’s easy to create fare alerts and the prices lower than I’ve seen. Just alerted of a fare drop and snatched up 2 seats to Mexico. Thank you Momondo!! Very happy with the app. Got my flights in 123 very easy and also gave me the cheapest flights ever. Love it!!!! Very good app to use to look for flights! The only problem I have with it is that when I go back to look at my favorites it seems to always switching the departure and return flight or have both departure and departure flight. Might be just a glitch though so I hope that gets solved. Either good app! I’ve used momondo for some time with basically no problems. Recently it only shows me Virgin America flights and I cannot choose all airlines with the filter. It’s useless. Not working after recent update. Deleted. Saved me so much money! Very user friendly! Got me an amazing deal, great price AND nonstop both ways. Definitely will use again! And honest. Love the rating of flights by time and cost. You want to find the best travel deals? This is the site to use! 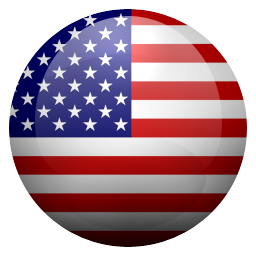 Momondo searches more airlines domestically and internationally to bring you the best deals. The app is super user friendly and helps you find the best flight for the best dollar possible. Love them! I should've deleted after the first time I "reserved" a trip at one price only to be informed the price had magically increase by $100+. It won't happen a third time. Couldn't be happier to delete. I spent hours on the phone with Momondo and they refuse to refund my ticket when their calendar was incorrect. I sent many screens shots to them and they still placed the blame on me. There’s a 50/50 chance that when you search a flight and it shows you the initial cheapest price that it’ll actually have it once you click for t to show you the results. The other half of the time you get really excited thinking there is a cheap flight to somewhere exciting and when you click to view the results, the price is no where near the amount it said it would be. Extremely frustrating. It’s worth checking with to see if there really is in fact a flight at that price, but mostly you just get your hopes up and then get frustrated at Momondo for tricking you. Hopefully this is just a Black Friday/ Cyber Monday fluke. Using this ap I tried to book a flt and kept getting kicked back. I finally called Crystal Travel and the rep told me I kept getting kicked out was the flt/seat was no longer available, so I booked another flt for about $200 more. I later found cheaper flts and called them back to complain. They would not give satisfaction until about 1/2 hour later they called and emailed me about canceling the flt and were refunding me the full amount. I later booked a flt with Hawaiian Airline for much more satisfying fare. Checking the Momondo ap again I found it still list the lower unavailable flts (typical bait and switch tactic)! Removing Momondo from my iPad. I found a ticket for an international flight with 590$ on this site. The cheapest price i had seen elsewhere was 710$! I’ve used this app to save serious money on three separate flights thus far. It consistently beats Google Flights and all the other apps in finding the lowest airfare available. It is now my go-to when planning a trip. When you select your flights, enter your contact and credit card info, and click book, a customer should be able to confirm their booking. NOT receive an error message that the price YOU listed and the customer AGREED TO PAY is no longer available. Say that from the beginning. In a world of flight apps, Momondo was one of my faves. Never again. Use Skyscanner, Expedia, literally any average app out there if you don’t want to be lied to, and your personal information compromised. So I searched for and found flights, then when I tried tapping on one ... nothing. What is this app supposed to do? Just tell me there are flights without giving me details like where the layovers are? And most of the flights are labeled "Major US Carrier" ... now you won't even tell me the name of the airline? How am I supposed to look that up? At least I know it's not Delta, because this app can't find any Delta flights. Really??? What use is this worthless app????? I always get good results with the app. They really search high and low for the best prices. Great and easy to use. Thanks Momondo!